Timing is the key. Everyone has heard that before. Every place has its treasures, but you must be in the right place at the right time. I love wild greens and I love Maine. It’s where I was born and I lived there until I was 22. Most people who visit do so in the summer, but if you don’t make it to eastern Maine by Mother’s Day you’ll miss the fiddleheads. That’s truly a shame. Oh, I guess if you live up in Aroostook you’ve got a bit longer, but even up in the County summer can sneak up on you. Fiddleheads (Matteuccia struthiopteris) are properly called ostrich fern. When steamed or boiled they have a wonderful asparagus-like texture. Their unique flavor has no comparison. That assumes you’ve collected all of the proper species, have cleaned them thoroughly, and harvested them before they matured too much. Ostrich fern, a perennial, grows in the floodplains of rivers. Stem-like fronds are channeled or U shaped in cross-section. Plants have separate fertile fronds which contain the spores (reproductive structures). These will be persistent from the previous season and will be dead and brown in spring. New ones don’t develop until later in the summer. These dead fertile fronds can be used for filler in dried flower arrangements. The leaves unfurl when they develop, so you want to pick them while they are still rolled up. When they first emerge from their crown they look like the upper end of a violin, hence their name. You should make sure they haven’t matured too much. The heads should be tightly coiled with not more than a few inches of expanded frond. The bases (petioles) of the frond should snap off cleanly. Collect the entire clump. They’ll grow back. It won’t take long to amass gobs of them. The cleaning part can be tedious. Sometimes the brown membrane doesn’t come loose easily. Be persistent as this material is bitter. Your harvest may vary, and some may require very little cleaning at all. Often a little winnowing between two five gallon buckets is all it takes. If you collect more than you can use in 10 days or so you’ll want to preserve them. They can well and you may freeze them also. Just make sure you blanch them first. I have also eaten pickled fiddleheads, but I’ve never prepared them that way myself. 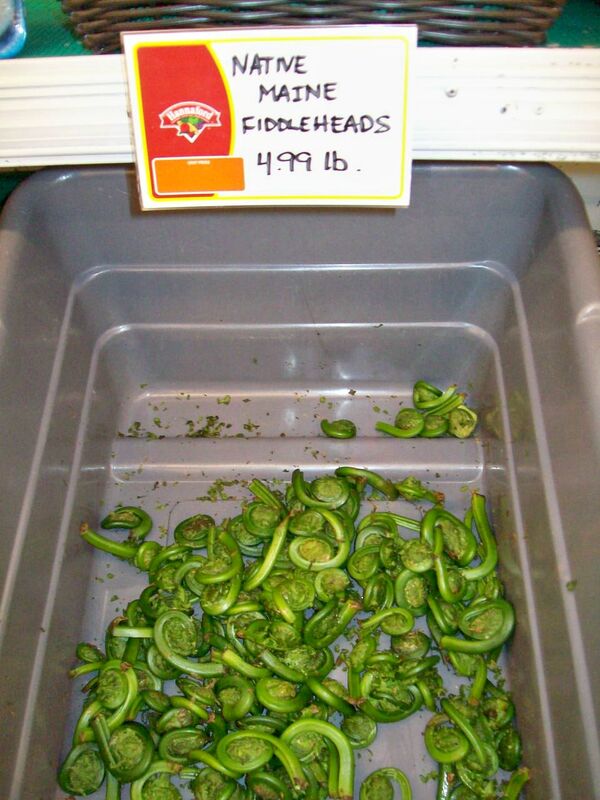 In addition to boiling or steaming, fiddleheads are great stir fried or baked in casseroles. They are even good mixed with green beans in a casserole. Experiment, because that’s the best way to learn. I don’t recommend eating them raw, although they taste fine and have no inborn toxins that I know of. The problem is that you will most likely collect them from recently flooded areas. Salmonella or other pollutants could be a problem. Above all, make sure you have the right species. Look for the U channel in the frond. They also should be free from any hairiness. 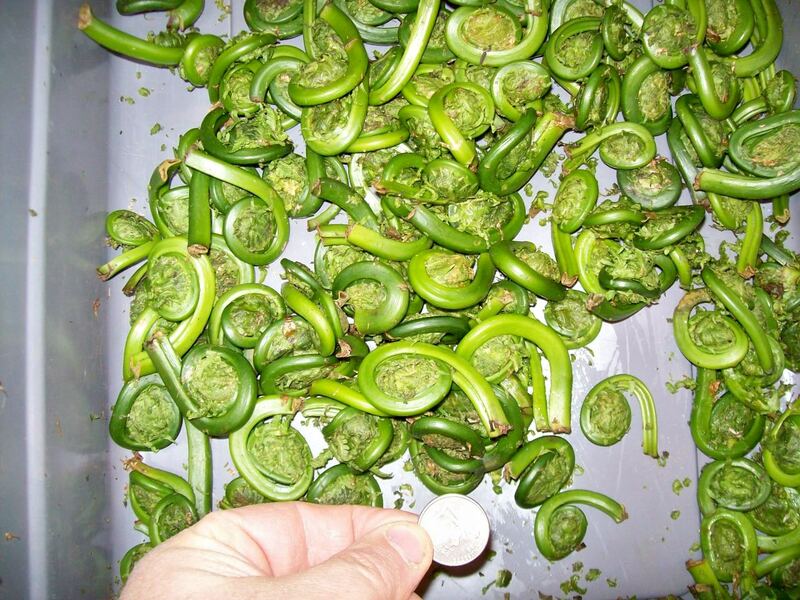 If you’re ever lucky enough to be near a riverbank in eastern Maine around Mother’s Day, try to find some fiddleheads. They’ll be worth it. Add a few fresh grilled or fried brook trout or smelts to the mix and you’ve got a memory that will last a lifetime. Mine has never faded. Yes, you can buy them and they command a good price. This entry was posted in foraging and tagged Fiddleheads, foraging, Matteuccia struthiopteris, nature, ostrich fern, wild greens. Bookmark the permalink. I was chatting with an online friend who grew up in the Phillipines, and she told me that one of the recipes for fiddleheads there is to cook them in coconut milk. Cool, I’ll have to try that when I ever get back at the right time. Ive never heard or seen these till now they were very insterting to read about. seeing as though there is more than one species im not sure if i would try this. it may be good but only if i get the right kind. i rather stick with the aparagus itself than to risk eating the wrong kind of a fiddlehead. These are really cool looking plants, and I’d wanna try them in my cooking sometime! This plants look cool but hard to clean. They are easier to pick when still rolled. And will be a dead a brown in the spring. Would like to try them but I never been to the Maine. The plant looks good and I like the color of the wild greens.